Get your awesome strategies in the ring to win! 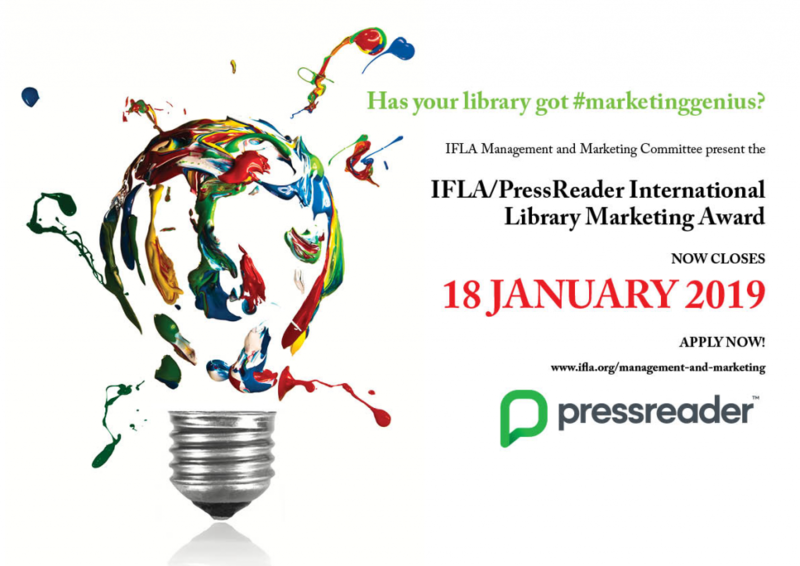 Apply for the IFLA PressReader International Library Marketing Award and win € 3000 towards registration and travel to IFLA World Library and Information Congress in Athens, Greece! As the leading digital and print-on-demand newspaper and magazine platform, PressReader will help IFLA continue to recognize and support creative, inspired, results-oriented marketing campaigns – with special commendation to teams in developing countries. Individuals who submit their application by the deadline will receive an exclusive one-month gifted access to PressReader. They will have access to the full catalogue of global newspapers and magazines on the PressReader app. PreviousPrevious post:Ever thought of presenting at IFLA Congress? Poster sessions are an attractive way to show your tremendous work!NextNext post:Want to share your work and findings with an international audience? The calls for papers for open sessions are now coming in!